The homeowners went in to our Gilbert showroom looking to update the look of their already beautiful South Phoenix home. 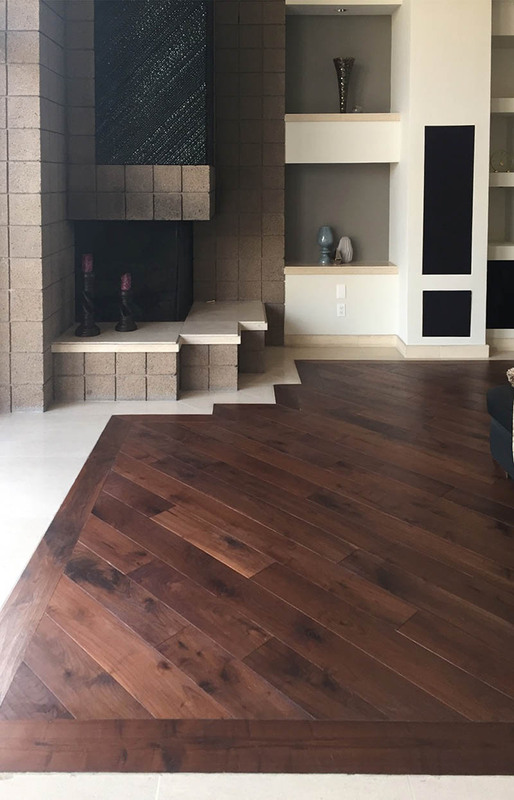 After looking through our selection and checking several samples out of our showroom they ended up choosing Antique Impressions 6” Walnut Ferrera. Handmade walnut flooring in an exotic cherry-brown. Each plank is hand-worked and given a timeworn surface texture to create the aesthetic of a genuine foot-worn floor from a bygone era. The bevels of every board are hand chiseled. All staining is done by hand to ensure that the wood will exhibit a lustre that only traditional methods can achieve. An Absolutely gorgeous floor with an inviting look. Soon after an estimator went out to their home to measure to provide a free estimate. During the estimate we noticed many transitions to stone that the homeowners wanted to address as clean as possible. After a meeting or two between our installers and production staff we found that a border around the entire room would really accent the floor and the room. To address the room flow we also laid the floor at a 45 degree angle. Another hiccup arose in dealing with stone baseboard in which we recommended the homeowner consult a stone trade to undercut the baseboard with a laser cutter so the wood could slide underneath, a much cleaner look. The Antique Impressions Walnut Floor came out spectacular! It flowed with the shape of the house and is warm and inviting. The character of the Walnut really fits the homes décor and feel. This floor is a great example of how a couple bumps in the road can produce great outcomes. We want to especially thank the homeowners on this project for being a pleasure to work with!